Todd Kelly has earned a hard fought fifth place in the third and final race of the Albert Park 400 at the Formula 1 QANTAS Australian Grand Prix in Melbourne, Victoria today. Kelly drove from 15th place on the grid to score fifth, running as high as third aboard the #7 Jack Daniel’s Commodore to end an otherwise tough weekend on a high. The Jack Daniel’s Racing driver was embroiled in an action-packed battle with several other cars over the course of the time-shortened race, losing third place in the closing stages as his soft tyres wore. Rick Kelly entered today’s race third in points for the event, but any chance of a podium was dashed when he and Craig Lowndes made contact on the opening lap at Turn 10, resulting in both coming to a stop against the concrete wall. The #15 Jack Daniel’s Commodore was then collected at high speed by Steven Johnson, followed by a third impact from the spinning car of Warren Luff, meaning it will be a busy week of repair work ahead for the Kelly Racing crew. Despite the three impacts, Rick Kelly was uninjured. He finished the weekend sixth overall on points for the meeting despite today’s crash. Jamie Whincup won today’s final race of the Albert Park 400 ahead of Kelly Racing’s Greg Murphy aboard his #11 Pepsi Max Commodore, with Garth Tander winning out in a tough battle for third ahead of Shane van Gisbergen and Todd Kelly. The third event of the 2011 V8 Supercars Championship is the ITM 400 in Hamilton, New Zealand on April 15-17. “From my point of view I’m extremely disappointed,” said Rick Kelly. 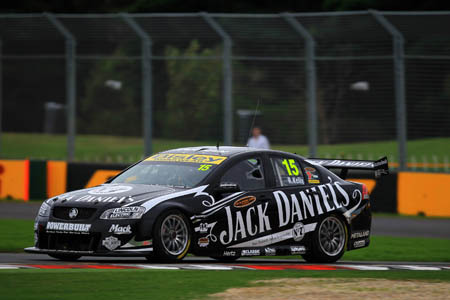 “The Jack Daniel’s Commodore has been ace the last two weekends and the team deserves to be on the podium. “An aggressive move by (Craig) Lowndes has ended with me in the fence and then obviously drivers ignoring yellow flags means that someone has collected us. “At the end of the day everyone has got their point of view. I’m pissed off about getting run into the wall and I’m looking forward to the Steward’s hearing. They will look at all the evidence and make a decision and we will be part of that process. “The changes we made overnight didn’t really improve the Jack Daniel’s Commodore much overnight and it absolutely smoked its rear tyres,” said Todd Kelly. “It was a hell of a race at the end there. The tyres fell off the back of my car and I did everything I could to keep those blokes behind me. “It was on for young and old so where we ended up was the best job we could do. “But overall for all four cars it has been a really good weekend for Kelly Racing as a whole. “Murph was great today in the Pepsi Max car, the way that thing hooked up in that last race was really impressive so we’ve got some good data from him to look through to keep pressing on. “We have carried the pace of the cars that we had from Clipsal over to here so it’s good for the entire team. “It wasn’t good seeing Rick’s car – that looks quite bad. The boys are going to have a fair bit of work to repair that. Between that and the Stratco car the fabricators are going to have a heavy-duty couple of weeks. “It’s good to have good drivers in all our cars. If one has a bad day there is generally one, or two, or three others running really strong.